Here are pics from when the puppies were first born. They are just sooo tiny! They have already gained 1/2 oz so they are doing really well. Ok finally got the pics.. they are so darn cute! Ella lines them all up together before she leaves the whelping box to get a drink or go potty. She's such a good mommy! I would really like to set something up like this in the future as Kim and I continue down the road of breeding dogs. This family really understands how to raise healthy puppies in a family environment. It breaks my heart to see puppies and dogs stuck in cages with no interaction with their human family. **Correction Caramel is a boy! So that's 3 boys and one little princess! Well Ella is definitely taking her time with this litter. Her milk has come in, the babies are moving all over trying to get comfortable. Today is day 60 so maybe they will come tonight or first thing in the morning. I am going to pick up Kim in a few hours from the airport, unless something changes with Ella. Her temperature has been in the 99's all week, only dropping to 98.7 once. That may explain why she hasn't delivered. She was pacing and whining pretty intensely this morning, I took her outside and all she wanted to do was eat grass. She's been very intense on eating the grass the last couple of days. Today not as much. When I brought her in she continued pacing and whining, after another 2 hours of this I took her outside again. This time she went potty. We went back inside and she's been sleeping for most of the day, and appears quite calm. The heartbeats are strong and everyone appears very healthy, so we will just wait it out. Well it is definitely looking like today or early tomorrow there will be puppies. This morning her temp was 99.7 by around 10 it had dropped to 98.6. She has been moving around a lot, can't get comfortable. She will lie down, then get up and walk across the room and lie down again, then back across the room. This has been going on since about 6 am. She also will not let me out of her site, if I am she starts to whine quite insistently. The babies are very active, if you touch her belly you can feel them move around. Her belly is huge and they are probably getting cramped. I've gone through the list twice .. ok more like 7 times to make sure I have everything ready. I have a scale, yarn, notebook, alcohol wipes, gloves, scissors, first aid kit, towels, garbage can, paper towels, and collars all standing by and ready to go. I wish Kim was here. 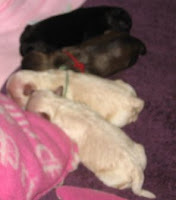 I've put a link to Ella's new blog, she is set to have Shih Poo's in the next few days. Max is a mini poodle that is Silver colored and about 5 lbs. So the babies will be small since Ella weighs in at a whopping 9 lbs. If her puppies are anything like the last litter, they will go fast. Ella is such a good mommy, I can tell that just from how well Daisy is. Everyone loves Daisy, even people that don't like dogs! The litter will be ready to go in time for Christmas, and these puppies will make such a fun addition to any family. They really do get along with children so well, and are so willing to play and play and play! Daisy is such a patient little girl, she seems to get these grass stickers matted into her fur almost daily. No matter how often I weed and pull them out she somehow finds more. But she is so great to just lay there while I pull the seeds out one by one. Max is the father of another litter that was born last week. Jack-a-poo's! 5 girls and 2 boys, the mom is a jack russell named Daisy (popular name!) Their family will be kept busy with that bunch!